A view of Earth from the Moon. This iconic photograph was taken by the crew of Apollo 8, the first manned spacecraft to leave Earth's orbit and the first to orbit another celestial body, the Moon. Apollo 8 launched from Launch Complex 39A at John F. Kennedy Space Center in Merritt Island, Florida, on December 21, 1968.. The spacecraft would was manned by Mission Commander Frank Borman (1928-), Lunar Module Pilot William Anders (1933-), and Command Module Pilot Jim Lovell (1928-). Apollo 8 returned to Earth on December 27. Original color photographic print, December 24, 1968: Private Collection of Dr. Calvin D. Fowler. 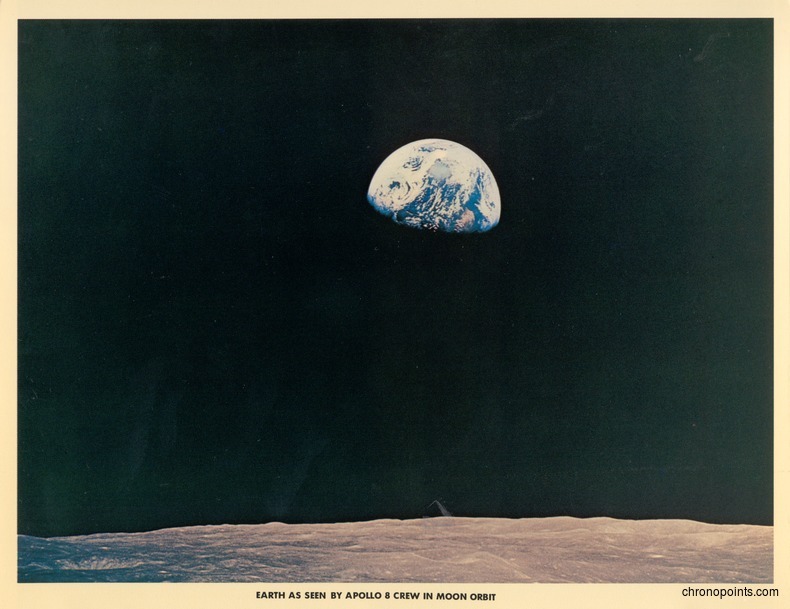 Digital reproduction of original color photographic print, December 24, 1968. National Aeronautics and Space Administration. 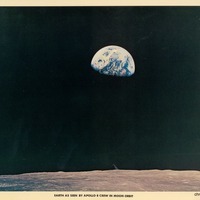 “Earth as Seen by Apollo 8 Crew in Moon Orbit.” RICHES of Central Florida accessed April 20, 2019, https://richesmi.cah.ucf.edu/omeka/items/show/6386.